Journalists and political analysts look at the political bubbles emerging from the ongoing meeting of the Communist party in Beijing, it makes more sense to look at the underlying economic currents, says renowned economist Arthur Kroeber, author of China’s Economy: What Everyone Needs to Know®. At NPR he looks back at some difficult years. China’s unstable economy has its beginnings not in China but on Wall Street in 2008, when Lehman Brothers filed for bankruptcy, setting off the worst economic crisis in living memory. 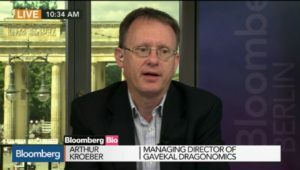 “In the year after the Lehman Brothers bankruptcy, the value of Chinese exports fell by about 20 percent, which is a very big deal,” says Arthur Kroeber, a founding partner of Gavekal Dragonomics and author of China’s Economy: What Everyone Needs to Know. In 2008, exports were the beating heart of China’s economy, employing hundreds of millions of migrant workers who were working their way up China’s social ladder to make up the world’s largest consumer class. How would a country accustomed to double-digit economic growth cope with tens of millions of workers suddenly out of work? China’s leaders didn’t wait to find out. Within weeks, they passed a historic stimulus package, injecting nearly $600 billion into the economy, an amount worth 15 percent of China’s entire economy. “It was by far the largest fiscal stimulus, in absolute terms or relative to GDP, of any economy in the world at that time,” says Kroeber. It worked a little too well. Millions of Chinese went back to work on infrastructure projects like the world’s most extensive high-speed rail network, highways and subway systems. By 2010, China was back into double-digit growth territory again. But all this new money flowing through local governments exposed deep-seated vulnerabilities in China’s political system — namely corruption, says Kroeber.